Cloud adoption is mainstream, but accelerating. Recent research from the Cloud Industry Forum found that nine in ten organisations (89%) currently use cloud-based services and the vast majority (85)% expect to increase their usage over the next 12 months. So, it’s a good time to explore the potential challenges, risks and rewards of multi-cloud adoption, so you can identify how to best exploit the benefits, while also avoiding the pitfalls. In this live expert panel, we turn our focus on infrastructure and explore in more detail why cloud networking in particular is so critical to your cloud strategy. Join our experts as they share their in-depth experience and learning and get some valuable tips on how to get your multi-cloud strategy in good shape. You’re under immense pressure for digital transformation. Moving to the cloud presents new possibilities: but the security of your data and apps is critical. It’s not all plain sailing because the cloud requires a fundamentally different approach to security. If you dig your heels in, you’ll find that Shadow IT increases and people will circumvent you. It’s also increasingly difficult to keep an eye on your entire network, so you’ll need to continually reassess where you’re most exposed. 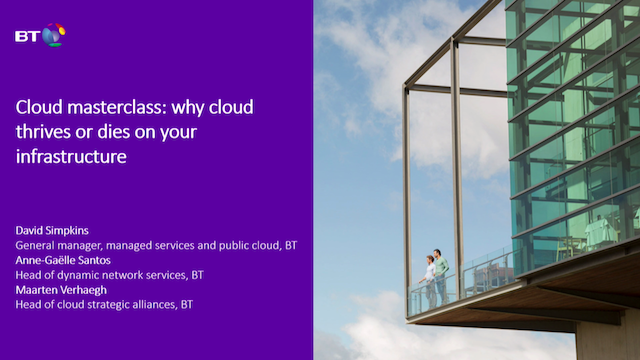 Join David Simpkins, General manager, managed services and public cloud, BT; Elena Christodoulou, Director, global strategic alliances, BT; and Dushan Ratnam, Senior product manager, BT, on 24 October,2018. Using the right technology to connect your sites and users across the globe and give them right experience, while keeping yourself secure needs a completely different approach. Cloud is integral to any digital transformation and offers many different benefits. But when legacy IT systems needs to be integrated, coupled with managing multiple public cloud services, it can be a real challenge for your network and security teams. • how to successfully manage end-to-end multi-cloud projects, using one of our customers as an example. We’ve helped customers handle huge, multi-cloud projects, manage seamless migration from their legacy systems, and work more efficiently around the globe. This event is a great opportunity to get tips and examples from our experts on how to rollout and manage multi-cloud projects. We can help you move to the cloud, make collaboration a key part of your culture, consolidate your IT, transform your customer service and simplify your network. And we’ll do all this with security built-in, not bolted on. We can help you balance the right combination of public cloud, IT or application requirements for your business. We’ll connect your sites, people and customers to secure, scalable cloud services that provide a great experience for everyone who relies on them, while protecting the data that flows around your business with a private cloud. •	And, in the last four years, we’ve won 16 industry awards for our innovation in cloud services.